Lapdog Creations: Make Mealtime Fun - Play with Your Food #PAW5 + GIVEAWAY! 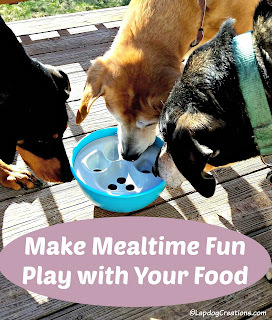 Make Mealtime Fun - Play with Your Food #PAW5 + GIVEAWAY! Do you have a hound who chows down his food too fast, or a smarty-pants pup who loves to work? Maybe even one of each? Disclosure: PAW5 sent a Rock 'N Bowl to Lapdog Creations in exchange for our honest review. I was not compensated for this review and all opinions expressed are my own. PAW5 is responsible for the giveaway prize. This post contains affiliate links. If you click on one and make a purchase, I may receive a few pennies to assist in maintaining this blog. The all new PAW5 Rock 'N Bowl Puzzle Feeder Dog Bowl - Fun Interactive Enrichment Dog Dish - Slow Feeder For Dogs - Stops Bloating - BPA and phthalate-free plastic Made in the USA not only helps to slow down eating, but it also makes meal time fun. Part Bowl. Part Puzzle. All Dog. Dogs are incredibly intelligent, social animals full of energy and enthusiasm. And like Penny, many of them are born with a strong work ethic. Unfortunately, with the always-on-the-go, multi-tasking lifestyle that many of us Americans now lead, our dogs are becoming bored, stressed, and under-stimulated. So, what's a busy family to do? 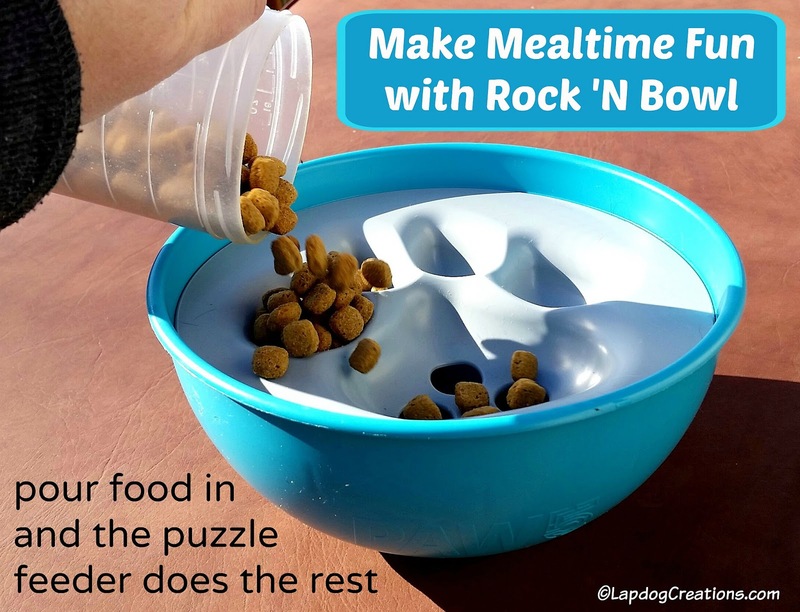 Make mealtime a fun time with Rock 'N Bowl! 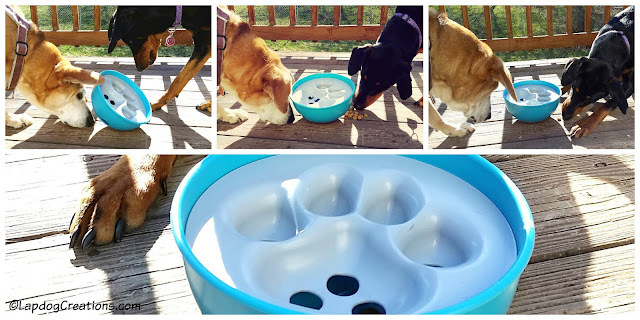 The environmentally friendly, interactive puzzle feeder makes dogs think and problem solve, while instantly rewarding them. Your enthusiastic pup will be, quite literally, playing with her food, and your chowhound will be slowing his roll! I love that the Rock 'N Bowl is so easy to use. It requires no more effort than a standard dog bowl. Just pour kibble directly into the top and let the bowl do it's thing. The food will fall into the hidden compartment, and your dog will nudge and paw at it, getting the bowl rocking, and the food tumbling out. It's also super easy to clean! 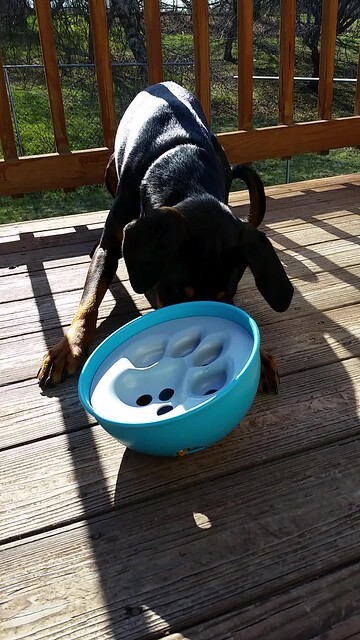 After your pup is done eating, the Rock 'N Bowl easily breaks down into three dishwasher-safe parts (top-shelf only). Now that is something this multi-tasking doggy Mama sure appreciates. The one-size-fits-all bowl holds up to four cups of food, making it suitable for just about any breed, and is currently available in two vibrant colors. We opted for the teal blue, but you might prefer the orange. As if that weren't enough to make any doggy Mama smile from ear to ear, the Rock 'N Bowl is made in the USA from BPA and phthalate-free plastic. 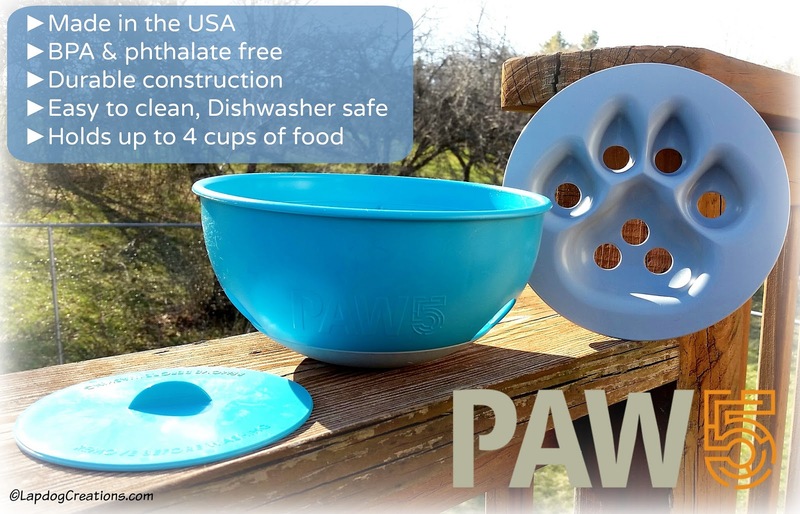 There's not a lot of standard dog bowls made in the USA these days (trust me, I've checked), which makes me an even bigger fan of PAW5! I love how interested all three of my dogs were in the Rock 'N Bowl. Penny is always looking to learn something new and to work, while Teutul sometimes needs a little encouragement to slow down at mealtime. The bowl is perfect for both of them. Sophie likes to eat, which makes the bowl perfect for her too. It's official, we love the Rock 'N Bowl and can't wait to see what's to come from PAW5! The company believes enrichment makes things fuller, more meaningful and rewarding and is committed to their Four From Five™ promise. Part Devotion. Part Respect. All Dog. So, what do you think of PAW5 and the Rock 'N Bowl? How would you like to win one for your favorite dog and start making mealtime fun at your house? 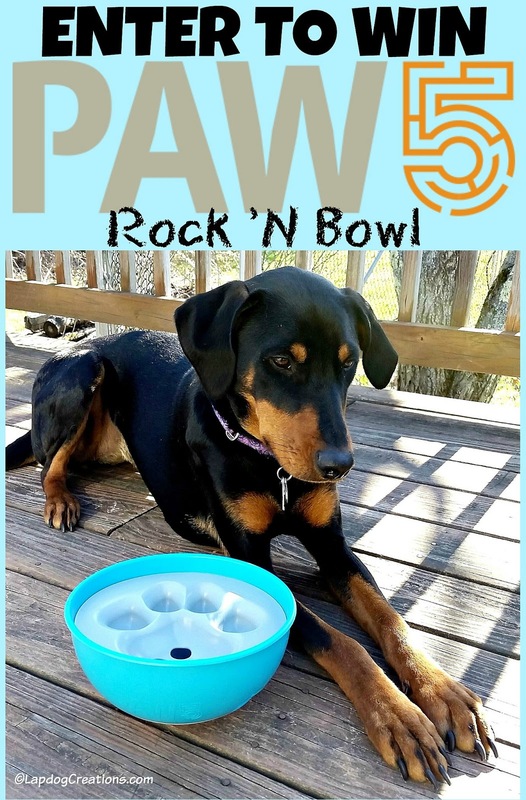 Thanks to the PAW5 folks, one lucky winner will receive a Rock 'N Bowl in the color of their choice (blue or orange). To enter, use the Rafflecopter widget. You are required to answer a question in the comments below - click on the Rafflecopter widget first to find out what that question is! After you complete this mandatory entry, several bonus entries will open up. My 3 fast eaters would love this!! Most of the bowls designed to slow down eating make it impossible for my flat faced dogs to eat but this would work perfect! Plus, it would make mealtime so much more fun!! Tank has one of those food dishes with the spikes poking up because he eats too fast. I think he would enjoy this - in blue, of course. Looks like the Lapdogs had a rollin' good time with it! 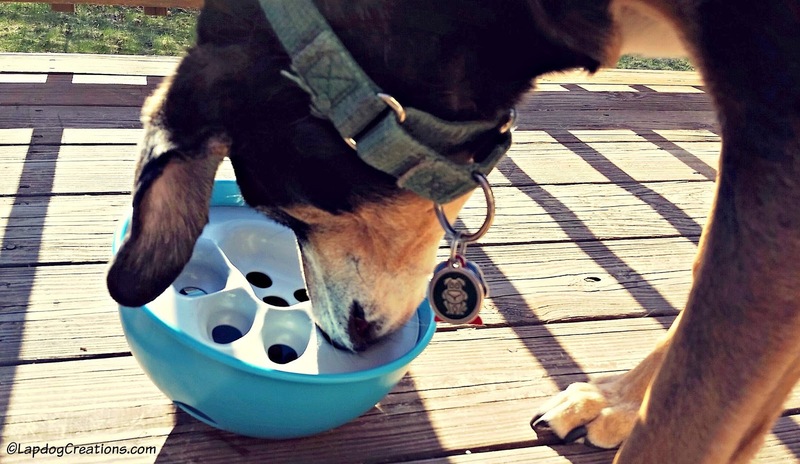 i think it is a great way to give your dog something to do while eating or giving them treats. i have one and leave treats in it when i leave the house to keep them busy. however, i heard 2 of the girls fighting over the treats as i left the house the other day. This food dish would be great stimulation for the dog! Sky used to eat from a slow down bowl. Now little Mackey gobbles her food. Sometimes it doesn't settle well and we're having trouble keeping her weight down. This type of bowl might help her, yet still seem like fun. My high energy quick eating pooch would love this. What an inventive idea. I love how it is a food bowl and those little noses really know there is more somewhere creating the game of finding it. This would be great for my crazy girls! Mr. N enjoys a good food puzzle. We have one from Christmas that we need to try out! That video is so cute! I think my dog would like this bowl, give him a little more do to a mealtime! That looks like a fun and challenging way to eat. Loved the video. I want to stop him from gulping his food. He eats too fast and I'm worried about bloat. How much do I want (need) this for Simon? Seriously! This looks awesome! Love the video and the review! Entering and sharing! Looks like a lot of fun. Kilo the Pug would love this - he gobbles his food but loves to play. What a great idea - we have a few fast eaters in our home. This bowl looks like a lot of fun! Who doesn't want both playtime and treats/food? I love products that help to challenge our pets' minds. The brain is so important and often neglected. I have a dog who could do well with the mental stimulation that this would give him. He's very food motivated, so it'd definitely be a hit. Thanks! We need a Rock and Bowl for Walter badly - I'll enter for this and LOVE this concept for a bowl. I don't have dogs but my best friend has a dog who inhales his food. She's tried other slow feeders but I think this one looks so much better. Da pups love your post - we think dis bowl is fabulous, thanks for sharing! What a unique bowl! I love that it holds 4 cups. It's perfect for every size dog. Two of my dogs eat too quickly, they all love puzzle toys, so this is perfect for them! I must get one of these for Henry. He inhales his food! We've tried several products and methods to slow him don't but he always figures out a way to work the system. What a great bowl! Many thanks to Sophie and Penny for the great demo! My Huskies all love puzzles, plus I have a gulper Husky and this would certainly help her to slow down! Great review and thanks for hosting the cool giveaway! What a cool bowl! Simba sometimes eats too fast...this is would help. This is a clever idea. I love that the dog has to think, has fun, and slows the digestive process down. A win win for sure! I wonder if my mom's dog would eat from this bowl. He inhales his food. This looks like a really neat bowl. My little girl eats her food so fast! This will definitely help. I have tried so so so many different slow feeder bowls for my boy Koda, and none of them have worked. I think this would be the perfect solution!!!! 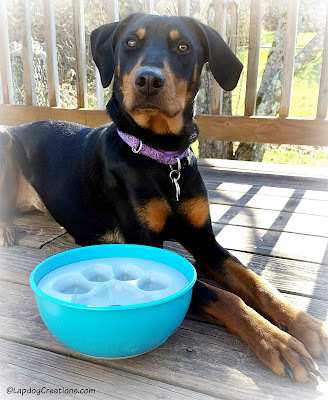 These playtime bowls are great for dogs with separation anxiety and fast eaters! I am decidedly pro-anything that stimulates a dog's mind to keep boredom from setting in! Wish I had this for our last dog Ernie - it would have solved many an issue! It would slow my dog down in eating..he is a gobbler! I want this because Victor, my dog, needs one of everything. And I love orange. I hear it's the new bark. I think this would be fun for my smartypants Briley! Anything that feeds her and keeps her entertained,is worth it. This would be great! I have two dogs, one very slow eater and one eater who is super duper fast. This bowl would make meal time more enjoyable for all of us if my fast eater had to work a little harder. This would be great for his mind also!